Save money. Teach your multi-age children with my free homeschool unit studies. Themed studies help your children overcome being bored with school. My family loves studying together. It has been the best part of teaching our children. Not only did we learn facts together we have shared experiences that we continue to talk about. The supplies you will need are inexpensive. You will want a Bible. Gather fiction and nonfiction books from your local library. Most of the craft supplies your probably already have. Don’t worry, each individual unit study will list the books and supplies that you will need. 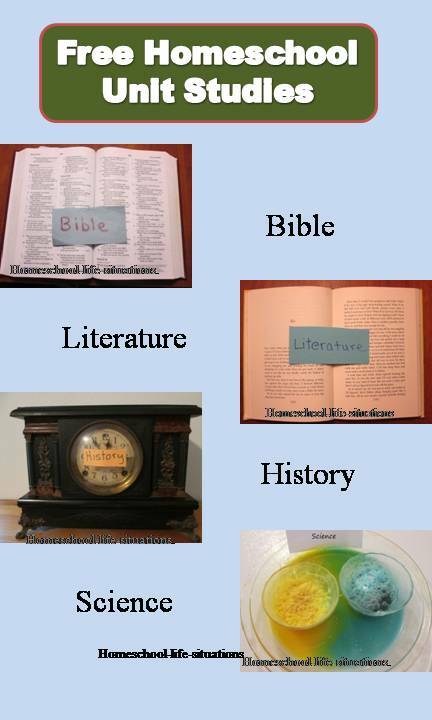 I like to combine science and Bible into themes. Creation - For each day of creation there are science activities, writing prompts, and books to read. Stars - Is written for young elementary aged children. They will learn facts about stars and observe the night sky. Noah and the Flood - You will learn about a faithful man in the Bible. For history your child will study boats. In science you will study the formation of rocks. Historical themes can help us see how others lived out their faith. Civil War – Use Christian books and biographies to learn about this time in American history. State Flags – Combine history, geography, and language arts to learn about the different states that make up the United States.This theme does not use the Bible. It is interesting studying why we celebrate on certain days. If you look at a calendar there is usually at least one special day. Many of the holidays that we celebrate have Christian elements. Christmas and Easter are about Jesus. Others such as Valentine’s Day and St. Patrick’s Day were started to honor saints. Many of the days have lost their Christian meaning. Valentine's Day - Learn some history and Bible verses about love. Then play a game about love. Thanksgiving - Learn why people in the United States celebrate this day. Your child will also have fun doing the crafts. Using free homeschool unit studies can show you how to combine books and hands-on activities to teach school. The fun projects can help your child from being bored with learning.